You're source for my take on the world of Android! So Assurion, our oh-so favorite insurance company for our beloved smartphones from Verizon (should you choose to purchase it through the carrier at least,) has developed an official mobile protection and recovery app for anyone currently subscribed to the insurance through their monthly plan. Droid-life.com managed to snag up the link where you can download this app right now if you would like and start using it. You really only need to have the insurance on your account. With that, Kellex from Droid-life stated that he was able to successfully download and install (and use) this app without having insurance on his account, so there may not be any real check and balance right now if you don’t really have the insurance, and still may be able to use the app. So as you can see this will be a pretty handy app if you don’t already have a similar service. I think this is going to cause me to ditch mine and solely use theirs. There’s just something about using the product from your insurance company that makes you hope if something does happen they have the proof already to back up your claim. Time will tell on that one though. If you’d like to download this app, head to the following URL from your phone. Then once it’s installed head over to https://www.mymobilerecovery.com/ to test it out! Fruit Ninja has over 2 million downloads already through other systems, and has just been released on the Android market! This game is highly fun and addicting. If anyone has a Wii, and Wii Sports Resort, there’s a game on their that lets you slash fruit in a specified direction in a timed fashion. Sounds very simple and juvenile but in reality it is very addicting and can be very challenging. Fruit ninja applies the same philosophy, although you’re not swinging a Wiimote around to slash your fruit, you swipe the screen. So all in all, without making this a review, I will say that the game is fun and WELL worth the measly .99 cents they charge for it, so go grab up your copy of Fruit Ninja now! There’s many imitations of this game, so I suggest scanning the QR code below to make sure you get the right one. Walking Navigation lets you use GPS navigation with walking directions that are more direct and use pedestrian pathways when we know about them. 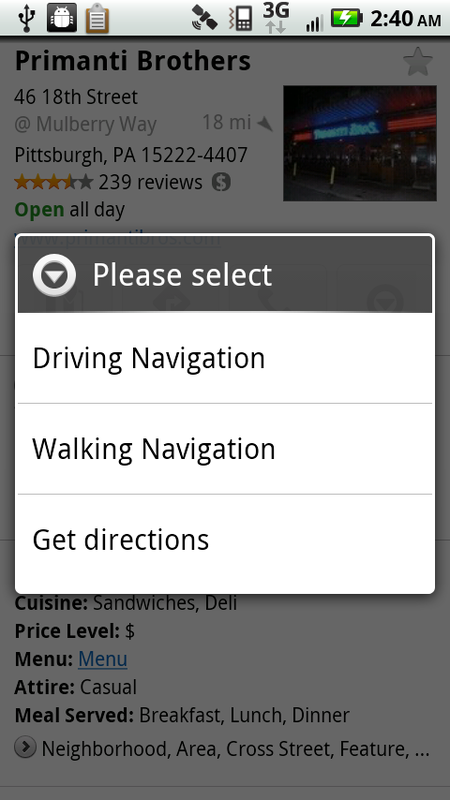 To try it now, choose the “Walking” option from the Navigation icon. Walking Navigation has a few changes that help when you’re on your feet. For example, your phone will vibrate when you need to make a turn. You can even turn off voice guidance and just use these notifications while soaking in the sights and sounds around you. To help you orient yourself with your surroundings, the map will rotate with you as you turn the phone, and walking mode uses satellite view by default. Use it like a virtual compass with satellite imagery to look ahead or help pick out landmarks along the way. If you want a sneak preview of where you’re going, use the new Street View on Google Maps with smart navigation and updated imagery. Just like with Street View smart navigation on your computer, you no longer have to slowly move down a street by tapping arrows along roads repeatedly. Now you can quickly navigate Street View by dragging Pegman from the corner and highlighting where you want to go with a lightly shaded “pancake” on roads or a rectangle on buildings. Let go of the screen when highlighting the front of a building, and you’ll fly there and turn to face it. With a swipe of your finger, you can hop rivers and scale buildings. Head over to the market and grab the update now! Get Android Notifications On Your Desktop! Although I wish it had a few more features, this is still a really cool service from an Android developer. If you’re running Windows or Linux ( or even a Mac still), grab the Android-notifier-desktop software from the project site, here. Now you need to get the application on your phone as well, so either search the market for android notifier or you can scan the QR code at the end of this article. Once everything is downloaded, run the file you downloaded on your computer and it will install it. (I only tested this on Windows, so please excuse any differences between what might appear or show up in other operating systems.) Once installed it should put an icon by the clock. Right clicking this icon will pop up a menu where you can choose preferences, and then set how notifications will be received (wi-fi or bluetooth) and other simple settings like pairing it with Growl. It’s pretty straight forward and highly easy to use. After that is set up (or even while the preferences are still on your screen) you can head to your phone and launch the app that you downloaded. 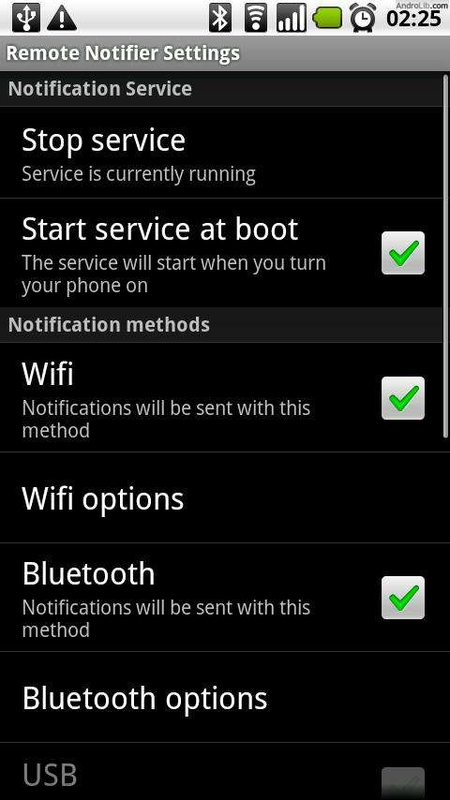 This should pop up some options as well asking you how to send the notifications from you phone, and towards the bottom you can do a test notification to make sure everything is working probably. Although they give some advanced setup features here for definitely IP addresses and whatnot, I didn’t feel it was very useful for a user that didn’t already know how to tinker with those settings, so know right after you install it out of the gate you should be getting notifications on your desktop. I tested with both wi-fi and bluetooth and both ways my notifications instantly popped up on my desktop. So it install’s and works easy, but there’s a few small downsides to this service. 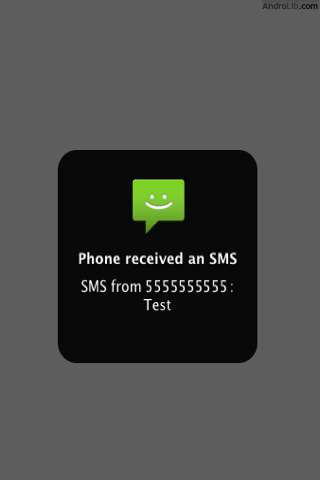 First, the only notifications you can receive are for missed call, voicemail, text message, and battery level. Those are all great and important, but I thought a surefire inclusion in this would be e-mail notification. Most people would think what’s the point being as you need to be on a computer to get these, but since I have an exchange account configured on my phone, it would nice to see that notification pop up on-screen as well so when I was at home on the computer I would know if something important came in via my exchange account which isn’t connected to my home PC. Other tiny issues I noticed with the desktop software were the blandness of the notifications, I would’ve liked to see something more than the default windows balloon pop up, but I guess that’s what Growl can be used for as it was a much better experience when that was paired up with it, for us at least. So all in all this is still a great little service and app that I highly recommend for anyone that spends a lot of time in front of their computer screen anyway. 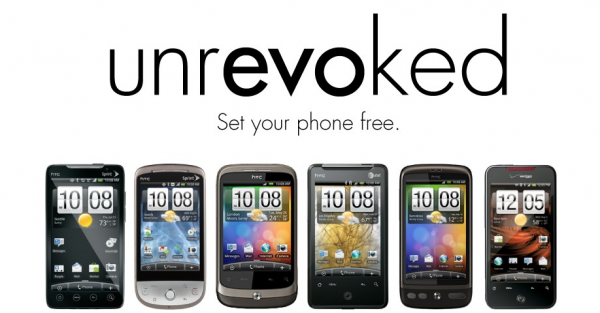 Users of the HTC Incredible, Evo 4G, or other HTC Android phones can now enjoy the world of one touch rooting, thanks to Unrevoked. This was released last night via their website, but initially pulled after some issues with the Evo4G, however it should be back up by now. So if you own an Incredible, Evo 4G or other HTC Android device and have been holding off on rooting, now is your chance to safely and easily join in the fun. 2. Windows users need to uninstall HTC Sync or any other program that might talk to the phone over USB (doubletwist, etc). Disabling HTC Sync from the system tray is not enough. They interfere with the root process and will cause problems. 3. When asked for USB connection type, select “Charge Only” and “Remember this”. Once those steps are complete, head on over to the Unrevoked website and grab the right download for your phone! A friend at work told me about this game, then I started seeing it pop up all over Twitter and everywhere else, so I figured I needed to give it a try. You start with four elements. Fire, Wind, Water and Earth. You start combining them with each other to make new elements. You can then combine the basic elements with these new elements, or the new elements with each other to continue creating. There are 300 elements total to unlock in the game and like I said it can be very addicting. There is an ad free unlock key you can buy for 2.95 if you wish, but it is from their proprietary store, not the market place. You can also buy hints in packs of 10 or 50 if you’d like, although I would think that would defeat the purpose of this kind of game. If you feel like wasting an hour or two (or three or four) then grab this one up. You can find it on the market or scan the QR code below. 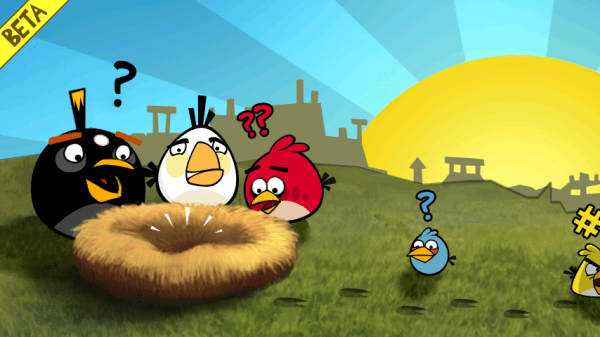 Angry Birds Is In The Android Market! It’s here! It’s here! Go grab yourself some Angry Birds and forget about anything productive you were planning on doing for the rest of the day!